All or nothing. This project will only be funded if it reaches its goal by Mon, April 29 2019 6:00 AM UTC +00:00. Fellowship first arrived on Kickstarter in September 2015, and funded with over 400% of its goal. Now we're back, with more to offer you than ever before! This project is funding two additional books: Book 2 Inverse Fellowship, and Book 3 A Fellowship In Rebellion. Fellowship is a game about going on an adventure, in the same vein as Lord of the Rings or Wakfu or The Legend of Zelda. The system is loosely based on the Apocalypse Engine, but the game does not feature the typical Game Master that many other tabletop games do. Instead, one player is the Overlord, a maniacal being who has become a Threat to the World, and everyone else forms a fellowship of heroes to stop them. The focus of Fellowship is on the journey you take and the communities you meet, and saving the day is what you're here to do. Fellowship is also famous for its narrative control - each player determines a portion of how the world works, and you work together to create the world you will save. But if you're one of the folks who has been playing Fellowship for the past 3 years since it came out, you know all that already. So what's in store with this new project? How about an updated core book, and two new books with 7 new basic playbooks, 2 new Powerful playbooks, the Ship playbook first featured in To Winter's End, and two new alternatives to the Overlord playbook, The Horizon and The Empire? Not only that, these new books are coming out along with a brand new second edition printing of Fellowship. And this new printing is available RIGHT NOW - as this kickstarter is launching, so too is the 2nd edition book on Drivethru RPG and itch.io. Anyone who has bought the first edition PDF now immediately has the second edition PDF! And on top of all that new content, each of the existing mini-expansions (The Giant, The Dragon, The Construct, The Remnant, The Spider, and The Pair) is being reprinted into one of the two new books, so all their useful info and errata is compiled together for your convenience. They are also being updated to comply with the 2nd edition of the rules, where applicable. Estimated completion date: RIGHT NOW! You can get the second edition book in PDF on DTRPG and itch.io immediately! (hardcover copies will be available soon) Most of the book is the same as the first edition, with the same art too. So what's changed with the new edition? First, a few of the basic moves have changed. The biggest change is to Finish Them. Before, when you'd Finish Them, you'd pick a stat based on how you were Finishing Them. But this ran counter to the rest of the basic moves, which you chose based on what you wanted to accomplish, not how you accomplished them. The new version of Finish Them picks a stat based on what you want to happen to your enemy. Each stat now has a unique 10+ result (including the Doom and Iron stats), although the 7-9 result is the same as it has always been: deal damage and lose your Advantage. The other basic moves to change were Speak Softly and Look Closely. They now always ask 3 questions on a 7+, but have unique consequences on a 9-. This gives these moves actual consequences to use, while also making them more reliable moves for information gathering overall. The other major change to this edition is the big Destiny Playbook rewrites. Destinies had a few issues, like some moves just being Bad and the Requirements being too game-y for my tastes. Now all Destinies should be satisfyingly powerful and interesting, even old duds like the Halfling Sheriff and the Knight. 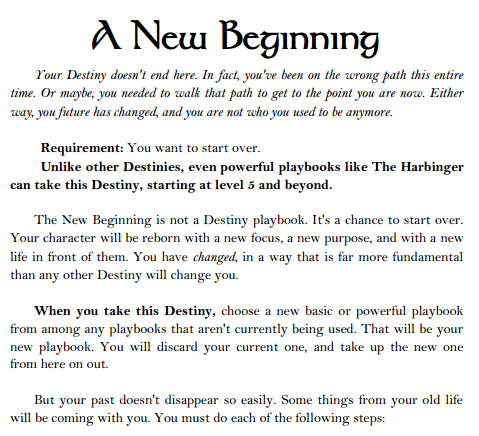 I've also added a new Destiny playbook - The New Beginning, that lets you start over with a new Basic or Powerful playbook while keeping some of the moves that were important to who your hero was before. 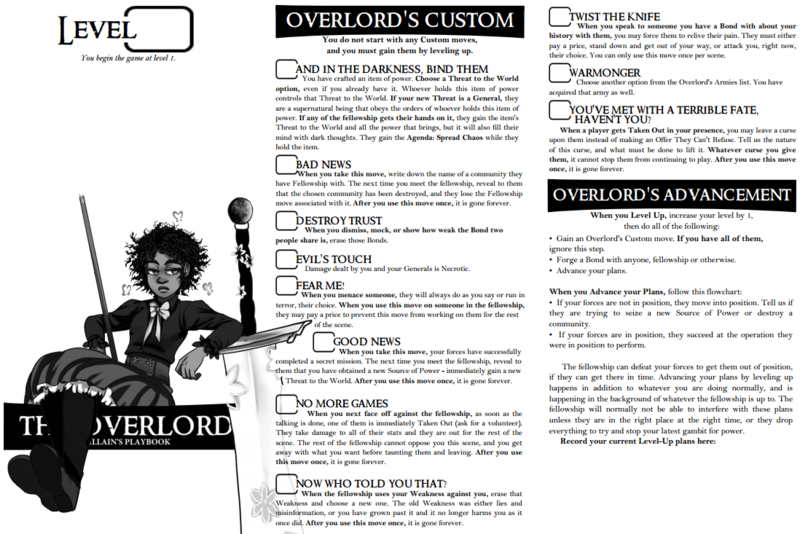 This second edition is also adding an often-requested feature - single page printable Destiny playbooks! These (and all other future) playbooks will be available with form-fillable PDF counterparts, for those of you that prefer online play. 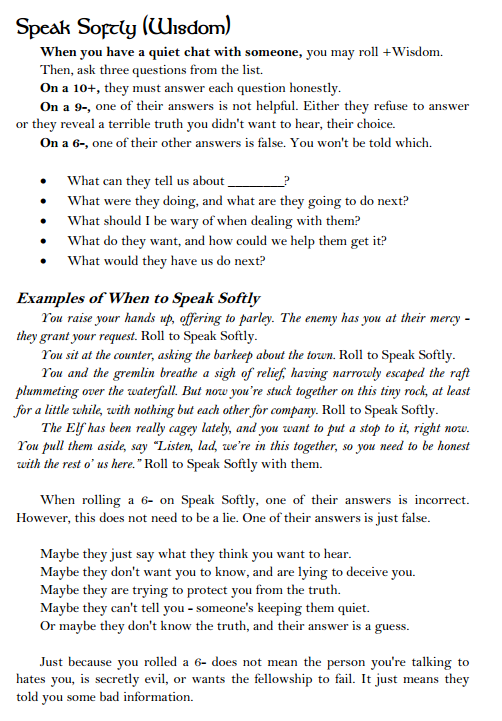 I've also added a Clarifications index to the back of the book, which contains a number of frequently asked questions about the game and my answers to them, including advice on earning Advantages, how to make new Threats, and how to make your own Set Pieces. Inverse Fellowship is the main reason for this Kickstarter. It is nearly all written, but I would like to fill the book out with new art. If this project fails to fund, I will still be publishing Inverse Fellowship, but all of its art will need to be re-used from previous projects, and I don't want that. Even with funding, I'll be re-using some of the best pieces from the original Inverse World book, but I'd like most of the art to be new. You will need the Fellowship 2nd Edition core book to use this book. This book contains a boatload of new content. 5 new Basic playbooks (The Beast, The Collector, The Lantern, The Rain, and The Tinker), 1 new Powerful playbook (The Angel), a Framework playbook (The Horizon), and the first collective playbook, The Ship, which the fellowship can use as a mobile home base they all work on improving together. It also contains everything found in the Constructed mini-expansion - the Construct playbook, the Machines overlord army, and the War Machine Destiny. Inverse Fellowship also contains a setting guide to the Inverse World, my widely acclaimed Dungeon World setting. Fellowship is a game where you normally work together to build your own setting, but if you want to set your game in Invells, this book has everything you need to do that. This includes Invells-specific Threats and Set Pieces, and The Horizon is specifically an Overlord-replacement meant for exploring weird worlds like Invells. The Horizon themselves is very different from the Overlord. While the Overlord gives your heroes a clear enemy to overcome, The Horizon instead gives them an open world to explore. This playbook gives the Horizon player the tools to make unique locations quickly, giving them different stats and threats and a boss, and making locations more dangerous the longer the players stay there, encouraging them to keep moving and keep exploring. The Horizon also gives each player a reason to explore, and tracks each players' individual desires to challenge them appropriately. For example, one player may be seeking Fame, trying to make a name for themselves, and another may be seeking Justice, trying to right wrongs and protect the weak, while a third may be seeking Fortune, trying to strike it rich out here on the wild frontier. The Horizon has a unique Cut and Agenda for each of these desires, so you can challenge your explorers with relevant temptations and dangers. A Fellowship In Rebellion is the second book this kickstarter is funding. I am funding both the art for this book as well as the time it will take to write it, as it is not nearly as far along as the Inverse Fellowship book. Rebellion is mainly a compilation of all the remaining mini-expansions (The Giant, The Dragon, The Remnant, The Spider, and The Pair), updated to the second edition where applicable, but it has new content, too. The biggest is the Empire, a Framework playbook that gives you a world already conquered, where evil is in control and has won. Your Fellowship is not a heroic band of travelers trying to stop evil. You are a rebellion, forced into hiding but always waiting for the moment to strike. To defeat the empire, you will need the fellowship of the people they have oppressed. While the Overlord is good for Lord of the Rings or Wakfu, the Empire is meant for Star Wars or Avatar the Last Airbender. There is a new Basic playbook, The Exile, representing someone on the run from the Empire. They are a wanted criminal, and they have important information for the rebellion. There is also a rewritten Basic Playbook, The Ogre. As fun as the Giant is, I think I overshot with them as the first Powerful Playbook, and they are difficult to keep in a party with most other playbooks. A Fellowship In Rebellion will feature The Ogre as a basic playbook re-write of The Giant, with The Giant's more overpowered abilities being moved to a new Destiny playbook for the Ogre. There is also a new Powerful playbook, The Nemesis, representing someone who is actively working for the Empire and is actively pursuing them a la Zuko or Catra, Darth Vader or Inspector Zenigata. The Nemesis is monstrously powerful and it will take significant leverage and character development to get them on your side, but turning them to the Rebellion will be vital for overcoming the Empire. 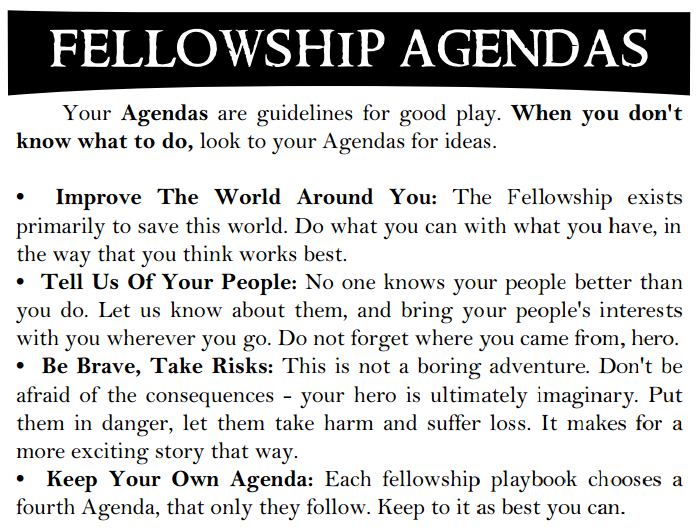 A Fellowship In Rebellion also contains the second team playbook, after The Ship: The Rebellion playbook. This playbook monitors the health of the rebellion, including your resources, your forces, your Fellowship, and your safe houses. Improving your Rebellion will be vital to overcoming the Empire, but the Empire knows this, and will attempt to destroy your Rebellion at every opportunity. Unlike the Inverse Fellowship, if this kickstarter doesn't fund, A Fellowship In Rebellion will not see print. I might do a second kickstarter in a year or so to try and fund just that book, if demand is high enough, but I do not have the money or art assets to release the book without the funding this project will secure. $1: Thank you! You don't get anything for this reward tier except my extreme gratitude. Every little bit helps, I am happy to have anything you are willing to pitch in! $14: Digital Fellowship. You get either the Inverse Fellowship PDF or the A Fellowship in Rebellion PDF, depending on which Digital tier you took. MSRP will be 15.95, so this is a 15% discount on the release price. $17: Physical Fellowship. You get either the Inverse Fellowship PDF or the A Fellowship in Rebellion PDF, depending on which Physical tier you took. You also get an at-cost print coupon for the same book, letting you buy it at no markup beyond production costs once the book of your choice is available for print (Oct 2019 or May 2020, respectively). $30: New Digital Fellowship. You get both the Inverse Fellowship PDF and the A Fellowship in Rebellion PDF. MSRP will be 15.95 each, so this is a 10% discount on the release price. $35: Complete Digital Fellowship. You get both the Inverse Fellowship PDF and the A Fellowship in Rebellion PDF, as well as the 2nd edition Fellowship book PDF. MSRP will be 15.95 each, so this is a 30% discount on the release price! $45: New Physical Fellowship. You get both the Inverse Fellowship PDF and the A Fellowship in Rebellion PDF. You also get an at-cost print coupon for each book, letting you buy it at no markup beyond production costs once the book of your choice is available for print. $50: Complete Physical Fellowship. You get both the Inverse Fellowship PDF and the A Fellowship in Rebellion PDF, as well as the 2nd edition Fellowship book PDF. You also get an at-cost print coupon for each book, letting you buy it at no markup beyond production costs once the book of your choice is available for print. $80: Deluxe Fellowship. You get either the Inverse Fellowship PDF or the A Fellowship in Rebellion PDF, depending on which Deluxe tier you took. You will also get a signed copy of the same book mailed directly to you, anywhere in the world*! They will ship out after the chosen book is finished, Oct-Nov 2019 or May-June 2020, respectively. *Please add $20 for shipping outside the USA. $180: Complete Deluxe Fellowship. You get both the Inverse Fellowship PDF and the A Fellowship in Rebellion PDF, as well as the 2nd edition Fellowship book PDF. You will also get a signed copy of all three books mailed directly to you, anywhere in the world*! *Please add $20 for shipping outside the USA. They will ship out together once all three books have been printed, est. May-June 2020. $200: Digital Expanded Horizons and $300: Expanded Horizons. You get everything in the Complete Deluxe Fellowship pack (and do not have to pay extra for shipping outside the USA). You also get to help me design a Set Piece to include in either the Inverse Fellowship or A Fellowship In Rebellion book, your choice! I will write the mechanics of your Set Piece myself, but it won't go into the final book without your approval that it accurately represents your idea. The Digital version of this tier does not include physical books. There are only six slots available for this reward tier. If we reach the $22,000 stretch goal, I will double the available slots of this tier to 12, and all of the new Set Pieces will be going into their own book - A Generous Fellowship. I withhold the right to reject submissions that have racist, sexist, or other offensive elements. You can message me here on kickstarter if you have any questions about this policy. $200: Digital Destiny and $300: Choose Your Destiny. You get everything in the Complete Deluxe Fellowship pack (and do not have to pay extra for shipping outside the USA). You also get to help me design a Destiny Playbook to include in either the Inverse Fellowship or A Fellowship In Rebellion book, your choice! I will write the mechanics of your Destiny myself, but it won't go into the final book without your approval that it accurately represents your idea. There are only five slots available for this reward tier. If we reach the $22,000 stretch goal, I will double the available slots of this tier to 10, and all of the new Destiny Playbooks will be going into their own book - A Generous Fellowship. $450: Digital Rebel Recruitment and $600: Rebel Recruitment. You get everything in the Complete Deluxe Fellowship pack (and do not have to pay extra for shipping outside the USA). 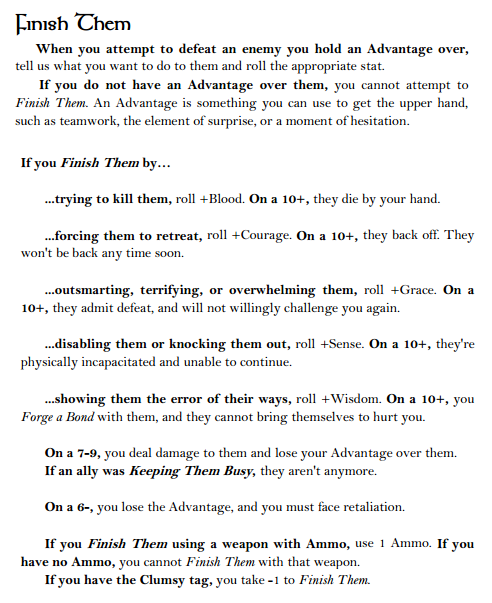 You also get to help me design a Playbook to include in the A Fellowship In Rebellion book! 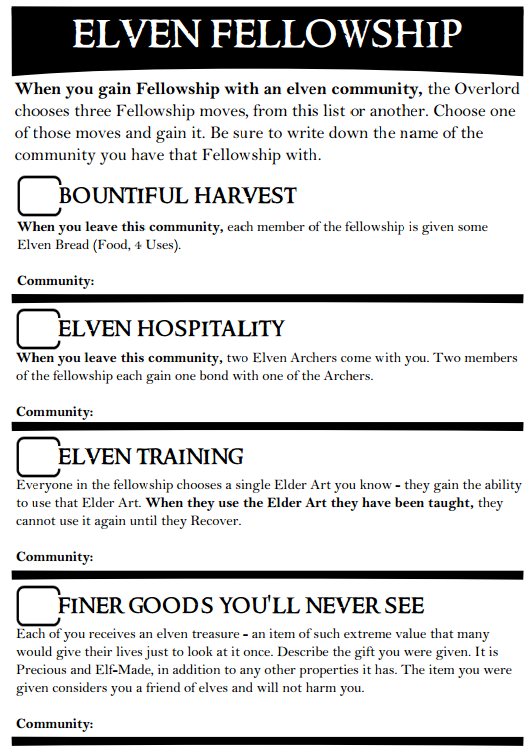 (Inverse Fellowship is too far along already to add additional playbooks at this time). Your playbook can be either a Basic or Powerful playbook, your choice. I will write the mechanics of your playbook myself, but it won't go into the final book without your approval that it accurately represents your idea. There are only four slots available for this reward tier. If we reach the $22,000 stretch goal, I will double the available slots of this tier to 8, and all of the new Playbooks will be going into their own book - A Generous Fellowship. Playbook Art: I am budgeting $240 for each playbook's art, so they can each get a proper spread of four characters like the playbook art in the original Fellowship book. This covers 7 playbooks in Inverse Fellowship, and 7-9 playbooks in A Fellowship In Rebellion. 16 playbooks x $240 = $3840. Additional Art: The two new Framework playbooks (Horizon and Empire) and the two new Team playbooks (The Ship and The Rebellion) also need art. I only need two pieces of art for each to fully represent them, at est. $100 per piece. 4 playbooks x 2 pieces per playbook x $100 = $800. Inverse World Art: I'd like to commission landscape artwork for the various regions of the Inverse World. Sola's Cage, the Cloud Sea, the Island Ring, a Worldcrust outpost, a Hidden City, and a Lantern Temple, at the very least. Landscapes are a bit more expensive, so I can expect to spend $250-400 per landscape. 6 landscapes x $400 = $2400. 40 Deluxe x $50 = $2000. (20 CDT + 4 EH + 2 RR) x $100 = $2600. 12 months x $200 supplementary income per month = $2400. If we somehow meet exact funding, I'll pay that last $40 out of pocket. Inverse Fellowship and A Fellowship In Rebellion will both be coming to print. Thank you all so much for making this possible! All three books will be available in Softcover paperback, if you prefer that to hardcover. All backers with a physical tier will get a coupon for both Paperback and Hardcover, and can choose which one they want to use (or even both, if you'd prefer). I will be commissioning art for each chapter of the two new books. With this, each chapter will have its own unique splash art for the first page of the chapter, adding a total of 8 new full-page art pieces to the books. At $22000, we will fund the fourth Fellowship book - A Generous Fellowship. The backer-funded bonus content will move from book 3 to this book, and I will double the available slots for all backer-funded content. Additionally, each backer will get to name a Threat to be added to this book. I will fill out the actual mechanics, but you may name it, describe it, and declare what one or two of its stats are. The biggest risk to the completion of this project is that both of my main artists I relied on for projects in the past (Maddi Gonzalez and H.P. Heisler) have been swamped with work and don't take commissions much anymore, so I will need to branch out to new artists. Thankfully, I worked with a few for Final Bid who I liked, so I have some places to start, but completing the art for Inverse Fellowship quickly will be difficult without my usual artists to rely on. I have a lot of experience with publishing books and fulfilling kickstarters now, so I feel equipped to handle any other risks or challenges that may arise. Every little bit is appreciated. Only want the Inverse World stuff? Get the PDF for Inverse Fellowship, as soon as its finished! Only want the Empire stuff? Get the PDF for A Fellowship In Rebellion, as soon as its finished! Only want the Inverse World stuff? Get the PDF for Inverse Fellowship, as soon as its finished! You will also get an at-cost print coupon for the hardcover physical book. Only want the Empire stuff? Get the PDF for A Fellowship In Rebellion, as soon as its finished! You will also get an at-cost print coupon for the hardcover physical book. You get a PDF copy of Inverse Fellowship and A Fellowship In Rebellion! You get a PDF copy of Fellowship 2nd Edition, Inverse Fellowship, and A Fellowship In Rebellion! You get a PDF copy of Inverse Fellowship and A Fellowship In Rebellion! In addition, you will get an at-cost* print coupon for both books in hardcover. *Fellowship's at-cost price is $31.45 + shipping. IF and AFIR will likely cost slightly less, but a similar total. You get a PDF copy of Fellowship 2nd Edition, Inverse Fellowship, and A Fellowship In Rebellion! In addition, you will get an at-cost* print coupon for all three books in hardcover. Only want the Inverse World stuff? Get the PDF for Inverse Fellowship, as soon as its finished! You will also get a signed copy of the hardcover book, delivered anywhere in the world! Only want the Empire stuff? Get the PDF for A Fellowship In Rebellion, as soon as its finished! You will also get a signed copy of the hardcover book, delivered anywhere in the world! You will get a signed copy of all three books, shipped to anywhere in the world! You get everything in the Complete Digital Fellowship tier, AND you get to add a Set Piece to either Inverse Fellowship or A Fellowship In Rebellion, your choice! Set pieces are boss fights or dangerous locations or strange events that require a significant effort to overcome, like a deadly kraken, a treacherous mountain pass, or a wild dragon. This tier does not come with physical books. You get everything in the Complete Digital Fellowship tier, AND you get to add a Destiny Playbook to either Inverse Fellowship or A Fellowship In Rebellion, your choice! Destiny Playbooks are second playbooks that players can take as they grow powerful, and give you access to incredible power. Existing Destinies include becoming a cyborg, becoming a paragon of your people, or stealing the Overlord's power for yourself. This tier does not come with physical books. You get everything in the Complete Deluxe Fellowship tier, AND you get to add a Set Piece to either Inverse Fellowship or A Fellowship In Rebellion, your choice! Set pieces are boss fights or dangerous locations or strange events that require a significant effort to overcome, like a deadly kraken, a treacherous mountain pass, or a wild dragon. You get everything in the Complete Deluxe Fellowship tier, AND you get to add a Destiny Playbook to either Inverse Fellowship or A Fellowship In Rebellion, your choice! Destiny Playbooks are second playbooks that players can take as they grow powerful, and give you access to incredible power. Existing Destinies include becoming a cyborg, becoming a paragon of your people, or stealing the Overlord's power for yourself. You get everything in the Complete Digital Fellowship tier, AND you get to add a playbook to the A Fellowship In Rebellion book! I will work with you personally to bring your concept to the table, where everyone will be able to use it. This tier does not come with physical books. You get everything in the Complete Deluxe Fellowship tier, AND you get to add a playbook to the A Fellowship In Rebellion book! I will work with you personally to bring your concept to the table, where everyone will be able to use it.